Today's APOD is an Extra Detail Magnification (or "EDM", for short), of yesterday's beautiful Contextual Image (or "CTX Frame", for short) where the NASA - Cassini Spacecraft captured an "Impact Crater Duo" - located on the Saturnian moon Dione - that is superimposed on older, Linear Surface Features. 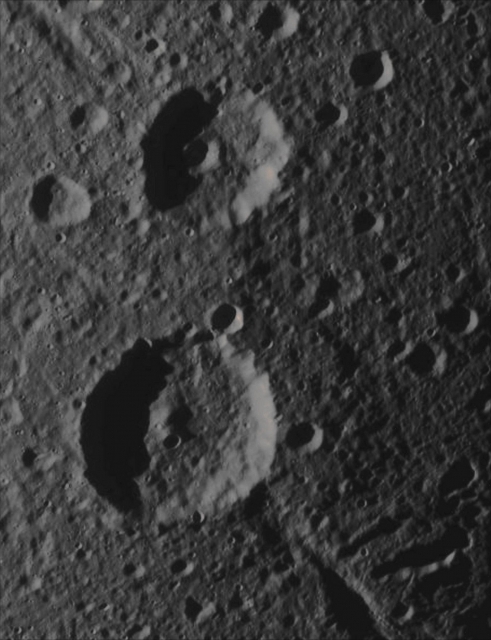 The upper Impact Crater of the pair, named Italus Crater, is overprinted on a grouping of ancient Troughs, called Petelia Fossae. On the other hand, the lower Impact Crater, named Caieta, sits atop a Surface Feature named Helorus Fossa. Planetary Scientists are confident that Helorus Fossa - as well as other Surface Features like it - is very old, both because there are many ancient (and, so far, Unnamed) Impact Craters on top of it, and also because of the way that some (unknown, in origin) Material has apparently filled in the shallow Valleys, giving to their edges a softer appearance. The Fossae of/on Dione - just like Helorus Fossa - are believed to be Tectonic Features that formed when the area(s) between the Tectonic Faults dropped down into Trough-like Structures. This Original View was centered on Terrain located at about 22� South Latitude and 73� West Longitude. The image was taken in Visible Light with the NASA - Cassini Spacecraft's Narrow-Angle Camera on September 30, 2015 and the Original Picture was acquired at a distance of approximately 25.000 miles (such as about 891.574 Km) from Dione. The Original Image Scale is roughly 804 feet (such as about 245,0592 meters) per pixel. This frame (which is a crop obtained from an Original NASA - Cassini Spacecraft b/w frame published on the NASA - Planetary Photojournal with the ID n. PIA 18359) has been additionally processed, contrast enhanced, magnified to aid visibility of the Surface details and then colorized in Absolute Natural Colors (such as the colors that a human eye would actually perceive if someone were onboard the NASA - Cassini Spacecraft and then looked outside, towards the Saturnian moon Dione), by using an original technique created - and, in time, dramatically improved - by the Lunar Explorer Italia Team. Different colors, as well as different shades of the same color, mean, among others, the existence of different Elements present on the Surface of Dione, each having a different Albedo (---> Reflectivity) and Chemical Composition. Note: it is possible (but we, as IPF, have no way to be one-hundred-percent sure of such a circumstance), that the actual luminosity of Dione - as it is in this frame - would appear, to an average human eye, way lower than it has been shown (or, better yet: interpreted) here.